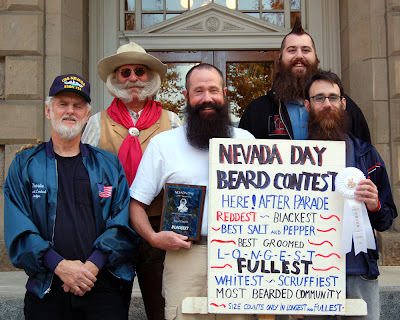 Four members of Beard Team USA pose on the capitol steps in Carson City at the annual Nevada Day Beard Contest with contest organizer Charlie Portia. From left: Charlie, Toot Joslin (former sideburns world champ), Captain Phil Olsen, Joshua Morris (current High Sierra champ), and Matt Guertner (third place, scruffiest, ND07). Nevada Day can be summed up in one word: blast. I just went through the archives and realized how fast time is flying by. We still have 17 months until competition in Alaska. 17 months seems like a long time until you look back at how fast time has gone to this point. At this point my beard is doing good but who knows what can happen between then and now. Hopefully I will be worthy of competition.